It all came down to this. After nine races and 22 hours of racing the manufacturer’s championship in the IMSA Continental Tire SportsCar Challenge was separated by just two points. The MINI JCW Team needed to finish in front of BMW in order to take home the trophy. This was going to be no small feat. All season long BMW and MINI had been swapping victories, coming into the FOX Factory 120 with four wins a piece. Taking on the challenge were the familiar faces you’ve seen all season, as well as the team’s fearless leader Luis Perocarpi. Perocarpi was filling in for Colin Mullan, who was headed to Europe after winning the prestigious Team USA Scholarship. Perocarpi joined Mark Pombo in the 52, a car that had won two races this season. The 37 was once again manned by Derek Jones and Nate Norenberg. 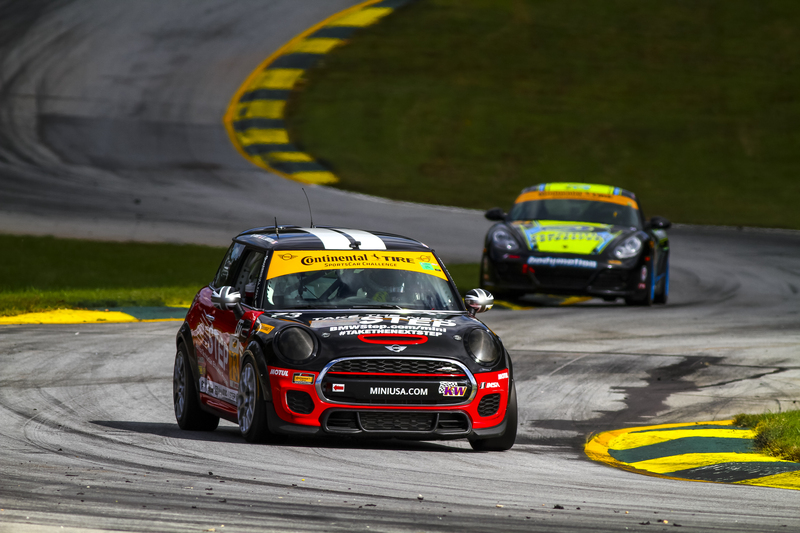 Norenberg ran the fastest lap for the MINI JCW Team in qualifying, winning the outside pole. 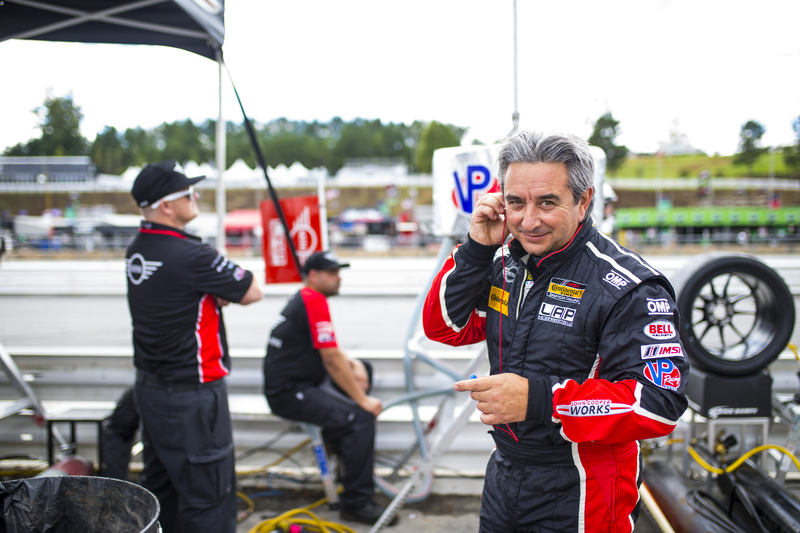 Team owner Luis Perocarpi preparing to race. All of the opening drivers, Perocarpi, Norenberg, and Mike LaMarra in the 73, did well during their runs. Maintaining their positions on the lead lap and never allowing the 81 BMW to get to comfortable. As the race approached the pit window a full course caution came out for an accident on the track. This allowed the MINIs to complete service and driver changes, as well as pull back up to the bumper of the 81. Shortly after the race resumed, the 73 now with Mat Pombo behind the wheel, found himself in third. Pombo, knowing he needed to finish in front of the 81 proceeded to push the car to the limits. Hounding the second place Porsche lap after lap, eventually getting by him to take over the position. With that task complete he set his sights on the leader. With forty minutes left in the race he was eight seconds back. Pombo continued to push, closing the gap to just over three seconds with twenty-four minutes left in the race. At that race pace fuel consumption was an issue and Mat was forced to bow to the pursuit. The 81 started to open up it’s lead again and the championship seemed to be slipping away. But with seven minutes to go the unthinkable happened. The 81 entered the pits for fuel, apparently not having enough to make it to the finish. If you’re not familiar with the history of MINI, it was bread out of a need for a fuel efficient car after the Suez canal crisis sent fuel prices soaring post World War II. How fitting was it then to see the 73 MINI, despite being pushed as hard as it was, still have enough fuel to make it to the end. After four years of hard work the MINI JCW Team was rewarded. Mat Pombo drove the 73 across the line for victory. 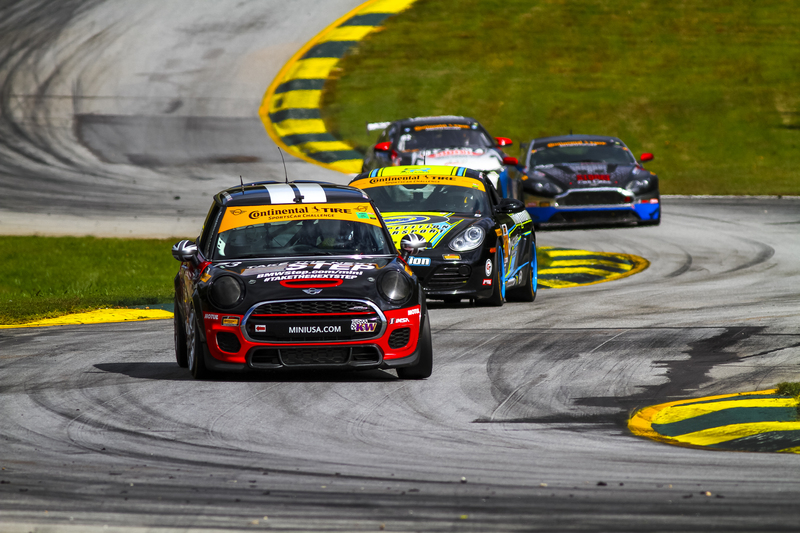 The finish winning the manufacturer’s championship for MINI, sending the team and manufacturer out on top in their final race, and the last race ever for the ST class of the Continental Tire SportsCar Challenge.